Ryan Smith had two goals and three assists in the Sacred Heart Greenwich lacrosse team’s 16-3 season-opening win over visiting Kent School on Wednesday. Wednesday, Sacred Heart Greenwich picked up exactly where it left off last spring, when it surged to a 17-2 record en route to registering another championship lacrosse season. Efficiently executing their offense, flourishing in transition and locking down on defense, the Tigers opened their 2019 campaign with an impressive 16-3 triumph over visiting Kent School. 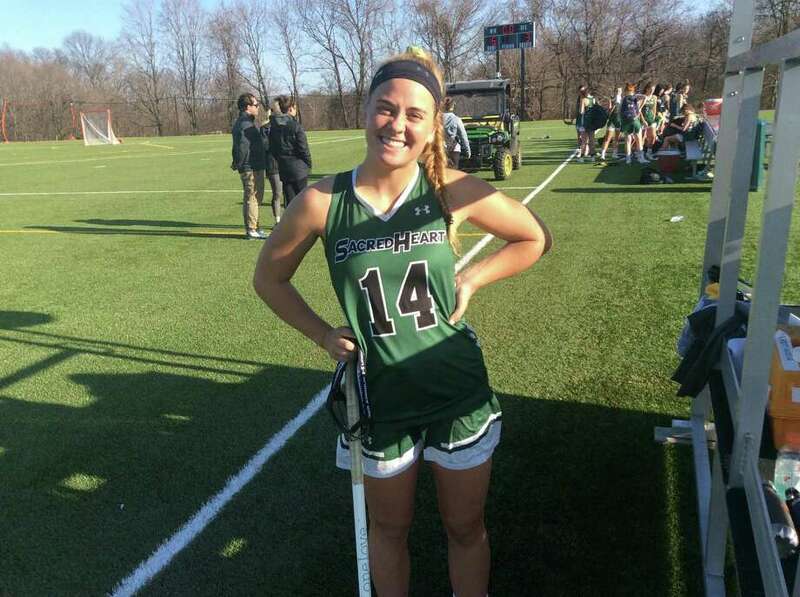 Displaying their numerous scoring options, four players tallied twice for Sacred Heart, which notched seven goals during the first 12 minutes of action, before entering halftime with a commanding 14-0 lead. Senior tri-captain Ryan Smith, junior Amelia Sheehan, senior Athena Corroon and sophomore Grace Lillis each recorded two goals for the Tigers, who controlled possession throughout. Junior midfielder Morgan Smith contributed one goal and a team-best five assists in the winning effort. Junior attack Katie Keller, Sheehan, Ryan Smith, junior Morgan Smith and junior Mia Cesare each converted shots over the first 10 minutes of play, putting the home team on top of the Lions, 6-0. Sheehan scored off a Ryan Smith pass from behind the net at the 13:11 mark, then Smith set Corroon up for a tally with 12:21 remaining in the first half, making it 8-0. Morgan Smith, a midfielder, won the ensuing draw and the Tigers settled into their offense. Freshman attack Dylan Drury later put an 8-meter shot by Kent’s goalie, putting the Lions in a 9-0 hole with 10:23 still left in the first half. Lillis added two first-half goals, while Corroon and senior attack Molly Haggerty each found the net with shots, stretching the Tigers’ lead to 14-0 at the break. Tri-captains Corroon and Hilary Hoover paced Sacred Heart’s effective defensive effort. Goalies Rachel Keefe (sophomore) and Laura O’Connor (eighth-grader) combined for three saves for the victors. “The ball was mainly on offense today, but when it was on defense, we really took care of the ball and we were making smart decisions in the midfield and always communicating too,” said Corroon, who will attend the United States Naval Academy, where she will play lacrosse. Kent, coached by Cortney Duncan, scored its first goal at the 23:05 mark of the second half. Hannah Kent had the Lion’s first tally. The Lions’ second goal came with 4:02 left to play, as Caroline Grout converted a shot. Kyla Wilson had the visitors’ final goal. Twelve players had goals for the Tigers in their season-opener, a pattern they hope continues. Many of their goals came in transition. Lillis, a midfielder, collided with a Kent player, fell to the turf and sustained an injury to her right knee with 1:06 remaining in the second half. Lilly who was playing on the defensive end of the field when the injury took place, walked off the field with the aid of a trainer on site and the coaching staff. “We were winning a lot of draws and pushing our transition, which is our bread and butter. But then we did slow it down and work it around. Our offense really sparked our win today,” Ryan Smith said.